Holly trees are iconic symbols of winter and the holidays, as their evergreen foliage and fruits endure throughout the cold weather. Holly trees are actually many species within the genus Ilex, and they demonstrate variability in growing conditions. Despite their traditional use as a symbol of winter, not all holly tree species will thrive in colder climates. Generally, holly trees will grow in full sun or partial shade, though some species have region-specific preferences. Japanese holly is a dense shrub with small, shiny leaves. It does not produce visible fruit. Japanese holly is sensitive to cold temperatures, though hardiness may develop. The shrub can grow in the sun or in partial shade, although plants grown in the sun are more likely to sustain damage from low temperatures. If you are trying to grow this shrub in an area with cold winters, partial shade is the best choice. Winterberry, also called Michigan holly, tolerates a wider range of climates. Depending on the cultivar, winterberry produces red or yellow fruit and may be leggy or compact. Winterberry thrives equally well in the sun or in partial shade. Inkberry gets its name from its distinctive and plentiful black berries. Inkberry is less tolerant of cold climates. While it thrives in full sun or partial shade in milder climates, in the north inkberry should be planted in the shade to protect it from winter damage. Possumhaw is a large, deciduous holly tree that retains its fruit into the winter. Possumhaw is a low-maintenance tree notable for its silvery bark and clumps of red berries. It should be planted in sun or partial shade. Blue holly reaches heights of 15 feet and, despite the name, produces the quintessential bright red holly berries. The tree is named for the bluish tint of its leaves. 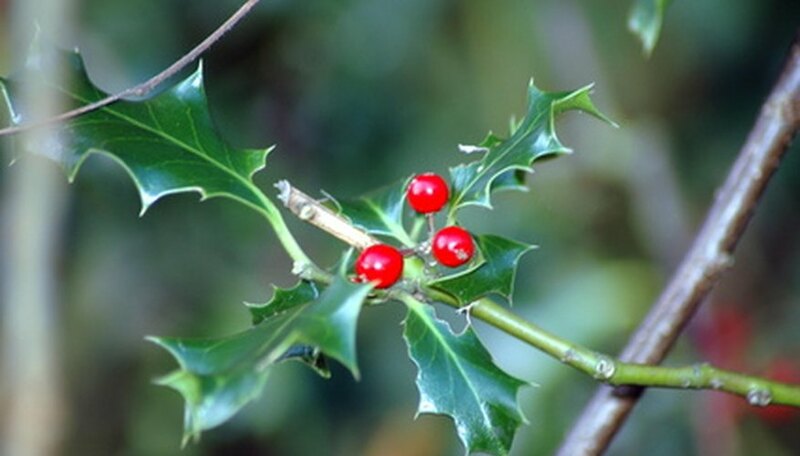 Blue holly thrives in a range of conditions and prefers full sun to partial shade. In 2001, the Pennsylvania Horticultural Society gave the American holly tree a gold medal for its ability to thrive in a wide range of conditions. American holly is a hardy evergreen, and cultivars are available that can grow in a range of areas. American holly produces white flowers in the spring and bright red berries in the autumn. The tree prefers partial shade or sun. English holly will grow into a large tree, producing red berries amid evergreen foliage. Although English holly grows well in sun or partial shade, it needs protection from extreme temperatures such as hot summer sun or winter winds, so you should consider your region when choosing a location for an English holly tree. Sunlight produces denser foliage, so if you live where temperatures stay mild, a sunnier spot is preferable.